If you need a record of everyone that enters or leaves your subdivision, lot, gated property, or a remote site, then our new stand-alone License Tag Capture System is an easy option. Take a look at the Factory Pre-Build Systems for single lane, dual lanes, or triple lanes. The Pre-Built Factory Kits on Pole(s) are wired for all cameras and the Outdoor NVR System (8 channel RV-5) on a pole or poles. All wires are hidden and protected. These poles are very easy to install as they are designed to be buried in a three-foot deep hole (just add concrete). A power junction box is supplied at ground level. The RuggedVision-5 eight channel NVR is an outdoor IP network video recorder that is waterproof and weatherproof, with a one terabyte solid state drive that is recording all the cameras. The system has a TP-Link Wifi box connected that gives the operator the ability to control program and review footage from any phone, tablet, or computer via Guard Station or Guard Viewer. The TagShot-IP is a license capture camera that records in 1080p (5mm -50mm long range lens) that can be zoomed to capture the exact width you need to detect license plates. The N-Range IR has a 2.8mm to 12mm zoom lens at 1080p, that records other information like the vehicle color, possibly a driver and passenger ( depending on window tinting and sun glare), as well as any signage on the vehicle or numbers on trailers. 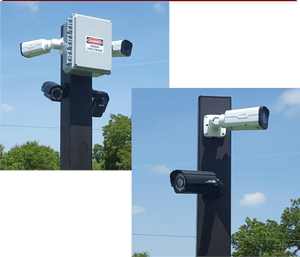 The Single Lane / Entry or Gate System is pre-build on a 9-foot (5-inch square) pole with the pre-wiring for the RV-5, Overview N-Range IP Bullet Camera, and TagShot-IP Licence Plate Capture Camera. The Dual Lane / Entry or Gate System is the same set-up as the single lane system but with an added N-Range and a TagShot-IP camera facing the opposite way. Triple Lane / Entry or Gate Systems is the same set-up as the dual lane system but has an added pole with just the N-Range and TagShot-IP cameras all pre-wired. These Entrance Guard Systems are commonly used as a Subdivision License Tag Capture Systems. Simply call one of our Design Engineers, here at RuggedCams toll-free 866-301-2288, and we will design what you need quickly. This entry was posted in Blog, Business and Industry, Industrial Security Camera Systems, Outdoor Security Camera and tagged Outdoor IP System.